Up to half of those who sustain a whiplash injury in an auto accident will not recover and will continue to suffer from ongoing pain and disability one year following the injury. An estimated three out of 1,000 people sustain whiplash injuries, which are most often associated with low-speed car accidents. Contrary to popular belief, it doesn’t take a large degree of impact to result in a whiplash injury, and although an injured person might continue to report whiplash symptoms for years, this type of injury does not usually show up on medical tests, making diagnosis problematic. Any impact or blow that causes the head to jerk forward and then backward, stretching and tearing the muscles and tendons in the neck and causing neck strain is commonly known as whiplash. The medical term for whiplash is cervical acceleration-deceleration (CAD) syndrome. According to the Mayo Clinic, whiplash occurs most often (but not always) as a result of rear-end automobile collisions. It is believed to result from the powerful, rapid backward and forward motion of the neck that occurs during such an accident, comparable to the cracking of a whip (hence the name whiplash). Pain and stiffness in the neck, ranging from mild to severe. Exacerbation of pain associated with movement of the neck. Loss of range of motion of the neck due to pain and tightening of the muscles. Headaches radiating from the base of the skull. Pain and tenderness spreading to the shoulders, upper back, or arms. Numbness and tingling in the arms resulting from spinal nerve root compression or inflammation. Sleep disturbances along with trouble falling or staying asleep. Dizziness due to neck instability or minor concussion. Blurred vision associated with nerve damage. Tinnitus, commonly known as ringing in the ears. Memory problems, difficulty concentrating, and other cognitive symptoms. Emotional changes including irritability, anxiety, and depression. 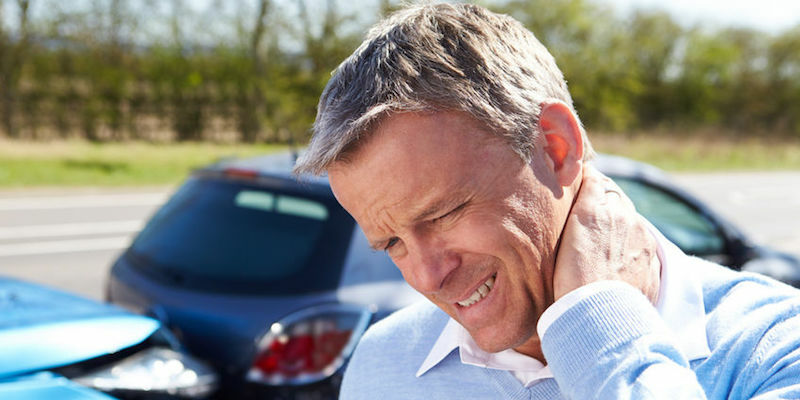 Although the symptoms of those who sustain whiplash usually improve within several weeks, some people will continue to have chronic pain for months or even years after their injury. According to research published in the Journal of Physiotherapy, up to half of those who sustain a whiplash injury will not recover and will continue to suffer from ongoing pain and disability one year following the injury. Whiplash symptoms that linger for years after a car accident but cannot be confirmed through medical tests could be the result of functional changes in the brain, according to research published by EBioMedicine. According to the study, there appears to be a close interaction between the neck and the brain involving changes in blood flow, which can result in increased and long-term pain after a whiplash-type injury. According to the study, significant changes to the blood flow to the areas of the brain responsible for pain perception and processing sensory information could explain why whiplash injuries cause some people to experience chronic pain symptoms. Such studies could potentially change public perception about soft-tissue injuries and helping whiplash patients get the treatment they need. If you sustained a whiplash injury in an automobile accident in Colorado, contact Colorado personal injury attorney Dan Rosen for a free consultation to discuss your legal options.